Acknowledged author Carolyn Jarvis PhD APN CNP wrote Physical Examination and Health Assessment, 7e comprising 896 pages back in 2015. Textbook and etextbook are published under ISBN 1455728101 and 9781455728107. Since then Physical Examination and Health Assessment, 7e textbook received total rating of 4 stars and was available to sell back to BooksRun online for the top buyback price of $14.34 or rent at the marketplace. 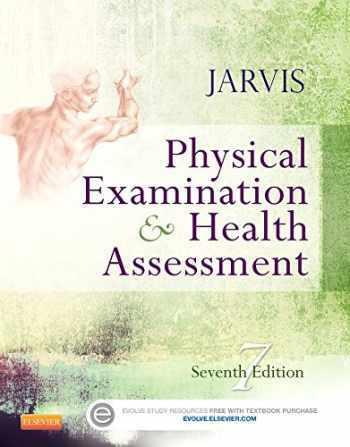 With an easy-to-read approach and unmatched learning resources, Physical Examination & Health Assessment, 7th Edition offers a clear, logical, and holistic approach to physical exams across the lifespan. A total of 1,200 illustrations, checklists of key exam steps, and practical insights ensure that you learn all the physical exam skills you need to know. Written by Carolyn Jarvis, an experienced educator and clinician, this gold standard in physical examination reflects what is going on in nursing today with coverage of emerging trends and the latest on evidence-based practice. It's easy to see why this text is, far and away, #1 in this field!A clear, logical, and streamlined approach simplifies content and helps you learn to perform the complete health assessment: The conversational, easy-to-understand writing style makes learning easier. A two-column format distinguishes normal findings from abnormal findings, and uses step-by-step photos to clarify examination techniques and expected findings. 1,200 full-color illustrations present anatomy and physiology, examination techniques, and abnormal findings. Abnormal findings tables include more than 300 pathophysiology photos to help in recognizing, sorting, and describing abnormalities. Comprehensive coverage reflects the realities of today’s nursing practice: NEW content on the Electronic Health Record, charting, and narrative recording provides examples of how to document assessment findings. 150 NEW normal and abnormal examination photos for the nose, mouth, throat, thorax, and pediatric assessment show findings that are unexpected or that require referral for follow-up care, with cultural diversity and developmental variations. UPDATED evidence-based practice content is highlighted and reflects a focus on conducting the most effective, accurate examinations. UPDATED case studies provide opportunities to apply your knowledge and develop your analytical skills. Checklists for use in RN-to-BSN completion programs provide a refresher for seasoned nurses returning to the classroom. A holistic approach to assessment accommodates the diverse types of patients that you will encounter in the real world: Documentation and Critical Thinking sections provide real-world clinical examples of specific patients and how to record assessment findings in the patient’s chart, using the SOAP format. Promoting a Healthy Lifestyle boxes enable patient teaching and health promotion while performing the health assessment, and now address the key concept of prevention. Developmental Competence sections provide age-specific assessment techniques for infants, children, adolescents, pregnant women, and older adults. Culture and Genetics sections include biocultural and transcultural information on an increasingly diverse patient population. Spanish-language translations highlight important phrases for improved data gathering and communication during the physical examination with Spanish-speaking patients. NEW evidence-based guidelines reflect a focus on conducting the most effective, qualitative exams.NEW Substance Use Assessment chapter addresses this increasingly critical aspect of holistic patient assessments.100 new photos of step-by-step examination techniques include all-new exam panoramas for key systems. 100 new abnormal findings photos provide instant visual cues for findings that are unexpected or that require referral for follow-up care.Expanded chapter on assessment of the hospitalized adult provides a focused assessment of the patient in the hospital setting.New content on obesity provides current information on this growing health problem.